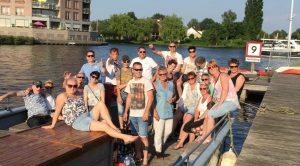 Whether it’s about a marriage, a family or bachelor party, an anniversary, or just an enjoyable and special day out in Friesland, Frisian Guide Agency can help you with the organization, shaping and execution. We – like no one else – know what Friesland has to offer. Our professional guides gladly show you the lovely spots and passionately tell about the beauties of the province. Maybe you already know what your visit to Friesland should look like, or maybe you don’t have a clue yet. Both is fine with us. We gladly help you out. Just give it a try.